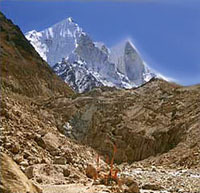 Gomukh, the terminus or snout of the Gangotri Glacier, from where Bhagirathi River originates, is one of the primary sources of the Ganges River. The place is situated at a height of 13,200 ft in Uttarkashi district in the state ofUttarakhand, India. It is one of the largest in the Himalayas with an estimated volume of over 27 cubic kilometers. It is a popular Hindu pilgrimage site, along with Gangotri, as well as trekking destination. 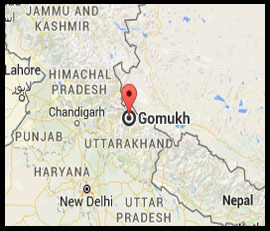 Gomukh is mentioned in the Puranas. It is said there that searching a lost sheep a shepherd boy reached near a glacier in Gangotri, the snout of which exactly looked like the mouth of a cow, and thus it got its name 'Gomukh'. From then many saints, holy travellers, as well as religious people went there to worship the place. Gomukh is 18 km from Gangotri in the foot hills of Bhagirathi at a height of 4255m. It is the snout of the Gangotri Glacier. The Bhagirathi river here is pretty speedy. Around the snout, nature presents a wild topography. There are bolders scattered here and there with some pieces of broken snow, along with the hard clayey snow of the glacier. The Gomukh snout is rapidly moving backwards. According to the modern research the snout has moved 1 km in just 70 years.